The Official Site of Adventures of Shadow® www.AdventuresofShadow.com - The Adventures of an Australian Shepherd and you will be surprised where they go next! Adventures of Shadow® Trailer that has traveled in 16 states and counting. 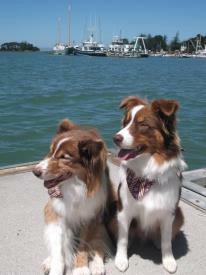 The Adventures of an Australian Shepherd and you will be surprised where they go next! Shadow was registered with ASCA and her official name was "Adventures of Shadow"
I am working on getting her registered with AKC since. Shadow did qualify but because we did not get the official papers before they changed the roles she no longer qualified. Shadow was the reason the Adventures of Shadow was created back in 2006 and that the second star Shadow "Scamp" has now taken over the role. Scamp is registered with ASCA, UKC and AKC and her official name is "Northern Lights Out of Shadows"
Starrr is registered with ASCA, UKC and AKC and her official name is "Northern Lights Adventures of Shadow"
She will help Scamp and they both will help carry on what Shadow started. Starrr came from Northern Lights Ranch - Ohio http://www.northernlightsranch.net/ All future stars will now come from Starrr - her first litter will be around 2018. The web stores do not carry everything - never has. We have a large variety of items in stock - mostly Christian items - Adventures of Shadow® items we have too - many are done when an order is placed. A few people believe if you have a trademark it has to be on the internet - not true. Look for our cargo trailer that have a variety of pictures of all three dogs along with the main logo of Adventures of Shadow® on all three sides. The trailer has traveled - since August of 2015 - in 16 states and about 10,000 miles and counting. Face-book website at.https://www.facebook.com/ShadowWarDogMemorial The memorial is being connected to a War Dog Memorial since all three of the Adventures of Shadow® dogs represents the War Dogs, Search and Service and K-9. At the moment the places that the memorials could be located is in three states, at the moment, still in working stages. The states are: California - Eureka, Ohio - two locations and Kentucky. The long term goal is to have at least one memorial in all 50 states. Stay tuned and the Adventures Continues...Tell your friends too! Until next time - Shadow “Scamp” says “Arf, Arf for Now and also be sure to place an order today!.